The air quality is so bad, nobody is immune from ill health effects, especially those with asthma or lung disease. Dr. John Gasman is a pulmonologist at Kaiser Permanente Medical Center in Fresno. He is seeing patients having problems because of the air quality. “Many of them have to come into their primary care doctor, to me, I met a few in the hospital this weekend because things flared up because of the weather,” said Dr. Gasman. He says while those with existing problems will have it worse, anyone can be impacted by this bad air. “A healthy person is going to have irritation of the eyes the nose, the throat, nasal drainage cough sneezing some people are going to have very irritated eyes,” said Dr. Gasman. “Any mask is going to be better than no mask but what we recommend is going to be something with a filter on it, this is an OSHA N 95, and it’s just a rating of what it filters out and this will pretty much filter out any kind of fine particle that’s in the air,” said Williams. Kevin Hall is among those stocking up on masks. He’s with the Central Valley Air Quality Commission. He’s relying on the latest air pollution information from the Purple Air monitoring network. The network is a nationwide series of air monitors set up by individuals and non-profit groups. Hall says. “The big advantage of the Purple air monitors is they give up to the minute readings, rather than the air district which takes an hour-long average and then posts that, by email and text 15 or 20 minutes after the hour has passed,” said Hall. But today the Valley Air Districts readings are also off the charts. Hall says you don’t have to rely on monitors and charts to know things are bad. “If we use some of our common sense we can look around and say that’s smoke and it smells like smoke is I safe, and the answer is, no you are not,” said Hall. Eleanor Simonsen of Fresno is also buying a mask, for her grandson so he can do some yard work. She has had it with the smoke. “It’s getting hard to take, it really is,” said Simonsen. GENE: She says it’s the worst she can recall. “Not this bad and I’ve lived here most of my life,” said Simonsen. The App called “Shoot, I Smoke” has used a scientific formula to calculate how the air pollution correlates to cigarette smoking. Based on their formula they calculated breathing the air in Fresno today was like smoking 8.4 cigarettes. The figure for Oakhurst, a foothill community closer to the Ferguson fire was 24 cigarettes. Breathing the air in Oakhurst was like smoking more than a pack a day. There are no indication conditions will change anytime soon. 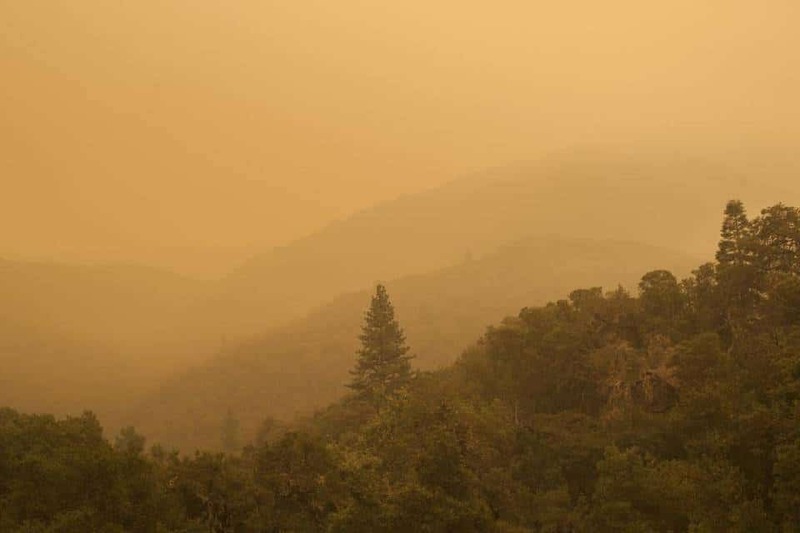 Smoke from Ferguson Fire raises air pollution to dangerous levels, by Gene Haagenson, ABC 30, August 6, 2018.